Luxury make-up made with carefully-chosen natural ingredients for flawless coverage and light-as-air-feel — now that's luxury touched by nature! What a truly great new product. 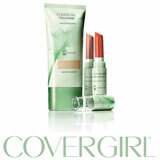 I have always been a fan of CoverGirl makeup and it is always my first pick. I tried this new line, the foundation and a lip gloss, and fell in love. My old CoverGirl foundation is good but this one blows the old out of the water. Not to mention I am all about being green and this stuff is made with natural ingredients, how could it get any better. The best thing is it isn't out of the world in price like the other natural/mineral makeups out there. Has anyone one else tried it? What are your thoughts if you have? If you haven't is it something you think you would try?